The photographs comprising Hrafnkell Sigurðsson’s Uplift series do not hide what they are: eerie, confrontational. With added lighting eliminating theatrical shadows, two stacked one-ton bales of compacted trash hover like ostentatious ghosts against the shady backdrop of the garbage processing plant where they are created. Staring blindly out at us are bags of rubbish—for residents of Reykjavík, our bags of rubbish. Plastic bags from grocery store chains are conspicuously identifiable by the unnaturally bright hues used for commercial branding: tangerine orange, sunshine yellow, bubble gum pink, and neon green clash in color disharmony, having been pressed together in an oddly painterly fashion. Staring back at the photographs’ reflective surfaces, we see ourselves, consumers who produced this waste, but we also see the architecture around us; the penumbral space within each photograph merges with the commercial gallery space. And so we know these works of art are, if we may grant them their own agency, self-aware as commodities for consumption. Though the looming trash bales are confrontational in this sense, their weight, tactility and smell so uncomfortably imaginable, Hrafnkell does not intend for them to confront us as the cause of this mass waste. Their challenge is subtler: to see beyond social-environmental concerns, beyond the repulsive, and to ponder instead whether these blocks of garbage embody some sort of human collectivity. They contain what we have discarded, yes, but they also contain the negative time and negative space of what we as consumers have not consumed. Seen thus, they are full of emptiness. Insofar as they are paradoxically not-us, they become entities of their own, still-life specimens held up for examination and documentation, each bale slightly different from the next. 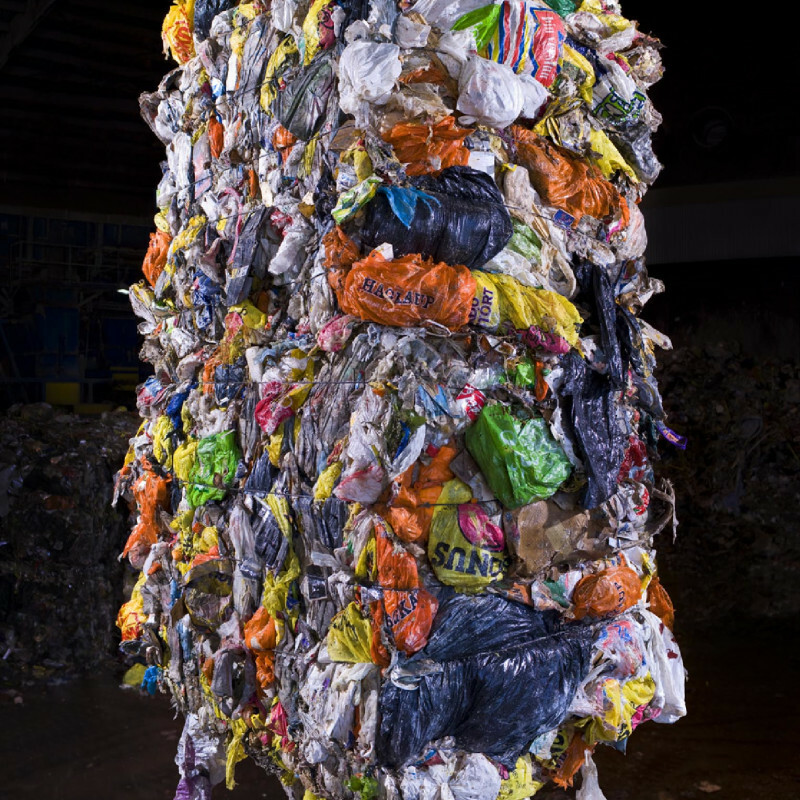 Just as they hang in the balance between the literal force of gravity and their representational lightness, the bales of trash and the Uplift photographs themselves—like so many of Hrafnkell’s works—are suspended between both temptations of the objective and the subjective.